Church of the Big Sky: Any savvy techies out here? Need help! Back when I had my Gateway Nightmare (that's a long, long story, worthy of its own entry), I ended up with a $75 credit from them for my troubles (along with a new computer.) I would have gladly purchased an iPod, had they sold them. Sadly they didn't. 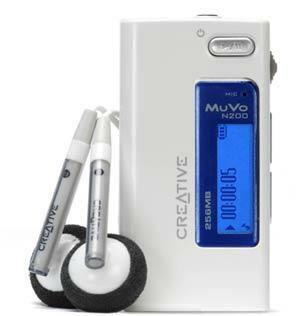 However, they did sell little Creative MuVo mp3 players. People over on epinions.com seemed to like them, and, since I had few options, I snarfed one. The MuVo arrived at my office shortly before The Incident which ended my fabulous government contracting career. I had just started using it as a radio at that point. After all the ugliness, I never even installed it in my computer to download music files. Finally, here I am, ready to do this thing, and I think I left the damn installation disk at my old stinkin' office. Crap, crap, crappity crap. Thanks to anyone who has any leads. Help a broke chiquita out. I feel like a geek crack addict. Man, I need the software. Don't you get it. I just need installation stuff, man. That's all. I promise. C'mon man! I have a friend that used to work for Creative as a programmer - I'll ask him. Oh, thank you, Spencer! Mucho appreciated!